Mulberry Small Zipped Wallet Coin Purse. I used this for a week on my most-recent trip. While I like the wallet for work (I also have it in red), I found it too small for travel. Has four interior cc slots— two on either side— plus one central card slip. Can hold 2-3 cards per slot. Also holds coins & folded bills. The color is a sort of sea green. Gold-tone hardware. Non-smoking household. This is by far one of my favorite style wallets as it holds so much for its size and who can resist this gorgeous Mandarin color- easy to spot in your handbag (aka- the bottomless pit). Mulberry Bow Double Coin Purse Holder NWT! The leather is a beautiful black silky classic calf. Serial # 1360819. Fabric Content: Leather. Color : Brown. Size and fit are approximations and may vary across designers. No size chart available for this item type. Size Chart. Size Guide. Dallas: 6805 Snider Plaza, Dallas TX 75205. RL401/123 MODEL.TEAK. MULBERRY. LEATHER TRAVEL WALLET CONGO. -VERY CLASSIC MULBERRY.GREAT QUALITY. -MADE IN ENGLAND. -WITH ORIGINAL BOX. -WITH ZIPPER POCKET. New ListingMULBERRY NIB BALLET PINK LEATHER BOW WALLET POCKETBOOK CARD HOLDER PURSE Sweet! Very pretty BALLET PINK Mulberry wallet. Small crease to the box. Up for sale is the ever popular signature Mulberry Oak wallet. I received it as a gift and never used it. You will only receive the wallet. Foil embossed Mulberry signature on exterior. Foil embossed Mulberry tree signature on interior. Color : Purple. About privacy. Pebbled Leather. 2 Separate Pockets (Zip closures). 8 Credit Card Slots. Foil embossed Mulberry signature. It is perfectly tailored for the highly organized (or those who wish to be!). One exterior zip pocket with gusset. Two internal slip pockets. Mulberry Women's Wallet/ Purse. Condition is Pre-owned. Shipped with USPS First Class Package. This small wallet features a leather body, front flap closure, top zip closure, and multiple interior slip pockets. Wallet only, no box, bag or receipt. Gently used and keep in excellent condition. Material: Leather 100%. It has had discoloration from storage. MULBERRY BOW CONTINENTAL WALLET made by the finest leather crafters in Great Britain. GORGEOUS CARD HOLDERS CHECKBOOK HOLDER. Soft goat skin, lightly finished to protect the surface. Two internal slip pockets. Six credit card slots. Plated gold component finish. This is a beautiful and classic Mulberry black, long women's wallet. Pre-owned. It has a thin stain on the front (visible in first picture) that can likely be cleaned off. Gorgeous. Similar style new is $415 retail. 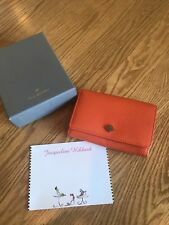 KATE SPADE Black Malea Mulberry St Wallet. Interior: Kate Spade Signature Fabric Lining, 2 Separate Pockets with Zip Closures, 8 Credit Card Pockets, 2 Full-Length Slip Pockets, 2 Full-Length Inside Pockets. 100% Authentic Mulberry Card Holder/Change Purse/ Wallet - Beige. Grained leather Comes with box. Received as a present. Never used. please let me know if you have any questions. Shipped with USPS First Class Package. Mulberry Tree Zip Around Purse. Mulberry signature Tree. A soft cow leather with a small printed grain effect. The leather is lightly finished to protect the grain surface. Black Small Classic Grain. MULBERRY DORSET LEATHER PURSE. MULBERRY TREE LOGO EMBOSSED ON FRONT. INTERNAL SUEDE LINING IN EXCELLENT CONDITION. Width: 19cm. MULBERRY DORSET LEATHER PURSE. MULBERRY TREE LOGO EMBOSSED ON FRONT. INTERNAL SUEDE LINING IN EXCELLENT CONDITION. BRONZE GOLD HARDWARE. Width: 19cm. Color: dark brown chocolate. material: leather. Product Details - Mulberry Amberley Long Wallet Dark Blush. Product Details - Mulberry Amberley Clutch Dark Blush. - Suede lined. - Brass component finish. - Six credit card slots. - one flat pocket at the front. Oak OSTRICH Leather. including typical MULBERRY oval disc attached to front engraved with "MULBERRY and EST 1971" plus the MULBERRY tree logo;. see last photo - information issued by MULBERRY. "An elegant & compact wallet with enough room for your essentials, the French Purse is a classic go-to accessory. Brass component finish Foil embossed Mulberry signature Popper closure. Mulberry Continental Wallet Rosewater Small Classic Grain. This Mulberry wallet is crafted from soft-grain leather, the continental wallet features a layered, fold-over design, perfectly organised with eleven card slots and a separate zipped section, presented with gold-tone hardware. LAST PRICE!! !MULBERRY Continental Ivory Wallet Excellent!!! MULBERRY Continental Ivory Wallet Excellent! EXCELLENT CONDITION! It has natural feeling of used but overall good condition. MULBERRY Continental Ivory Wallet Excellent!!! EXCELLENT CONDITION!!! SMOKE FREE HOME!!! PAY PAL ONLY!!! MULBERRY NIB BALLET PINK LEATHER BOW WALLET POCKETBOOK CARD HOLDER PURSE Sweet!